For more than a century, from 1900 to 2006, campaigns of nonviolent resistance were more than twice as effective as their violent counterparts in achieving their stated goals. By attracting impressive support from citizens, whose activism takes the form of protests, boycotts, civil disobedience, and other forms of nonviolent noncooperation, these efforts help separate regi For more than a century, from 1900 to 2006, campaigns of nonviolent resistance were more than twice as effective as their violent counterparts in achieving their stated goals. By attracting impressive support from citizens, whose activism takes the form of protests, boycotts, civil disobedience, and other forms of nonviolent noncooperation, these efforts help separate regimes from their main sources of power and produce remarkable results, even in Iran, Burma, the Philippines, and the Palestinian Territories. To ask other readers questions about Why Civil Resistance Works, please sign up. This book builds upon the themes of the authors' 2008 article of the same title in the journal International Security. This continues their research into the theme that non-violent political campaigns are more likely to achieve their intended goals compared to violent campaigns. This is based upon a comparative study of some 323 campaigns from 1900-2006, aggregated in the NAVCO 2.0 dataset, found here. There are also four detailed case studies: The Islamic Revolution in Iran, the First Infitada, This book builds upon the themes of the authors' 2008 article of the same title in the journal International Security. This continues their research into the theme that non-violent political campaigns are more likely to achieve their intended goals compared to violent campaigns. This is based upon a comparative study of some 323 campaigns from 1900-2006, aggregated in the NAVCO 2.0 dataset, found here. There are also four detailed case studies: The Islamic Revolution in Iran, the First Infitada, the People Power protests in the Philippines, and the ongoing dissent in Burma. The main reason for their greater rate of success, says Chenoweth, is that non-violent campaigns can more easily encourage more mass participation and from multiple additional demographics, and can achieve greater foreign support. When more groups are involved, the targeted regime loses its ability to govern effectively, whereas violence against a totalitarian regime can cause a 'rally round the flag' effect for its supporters. Great book. A little dry, but I liked some of the stories, especially about mass protesters in the Philippines who surrounded soldiers, offering them flowers and chocolate and inviting the soldiers to join them. Oh also the "confetti demonstrations" in the business district of Manila where 100,000 office workers marched in the streets as protesters threw down yellow pieces of shredded phone books from the skyscrapers. That's awesome. Basic take-away from the book: Nonviolent campaigns usually wor Great book. A little dry, but I liked some of the stories, especially about mass protesters in the Philippines who surrounded soldiers, offering them flowers and chocolate and inviting the soldiers to join them. Oh also the "confetti demonstrations" in the business district of Manila where 100,000 office workers marched in the streets as protesters threw down yellow pieces of shredded phone books from the skyscrapers. That's awesome. - They are able to mobilize greater numbers of people (because the physical and moral barriers to participation are lower). - They are able to mobilize more diverse segments of society (e.g. students, workers, families, clerics...). - A nonviolent mobilization has more potential to create loyalty shifts on the part of the regime in power (e.g. military or other forces refusing to obey orders) because participants are not using violence against them. Also since it is large and diverse, protesters are more likely to have connections to those in the military which can help lead to loyalty shifts. - Regime repression against large, nonviolent campaigns is more likely to backfire which can lead to greater mobilization, loyalty shifts in the regime, and international pressure. Very good examination of why nonviolence succeeds, by multiple indicators, over violence. It is a text book and written for scholars and students but is still worth adding to your library. What a fascinating book. A short confession: I am against political violence. The rating I've given might be in part due to the book agreeing with my views. Now that I've said that, the book is wonderful. It presents the idea that non-violent mass movements are the most effective way to topple repressive governments or acquire concessions from them. The researches have a data set of two hundred and some insurgencies, which they analyze from multiple angles. The first part of the book covers the t What a fascinating book. A short confession: I am against political violence. The rating I've given might be in part due to the book agreeing with my views. Now that I've said that, the book is wonderful. It presents the idea that non-violent mass movements are the most effective way to topple repressive governments or acquire concessions from them. The researches have a data set of two hundred and some insurgencies, which they analyze from multiple angles. The first part of the book covers the theory, the second part goes through four case studies to illustrate the points. The biggest lesson for me was how non-violent campaigns produce more stable outcomes than violent campaigns. Failed violent campaigns reduce the probability of a country remaining a democratic country five years after the campaign ends. In short, live by the sword, die by the sword. Insurgents who claim that violent resistance is necessary are probably always wrong. In fact, we conjecture that many of the groups that claim violence as a last resort may have never attempted strategic non-violent action, judging it to be too difficult at the outset. On the nonviolent/civil disobedience side we have Mohandas Gandhi, Martin Luther King, Aung San Suu Kyi, Desmond Tutu and Vaclav Havel; lining up with the armed struggle/revolutionary violence folks are George Washington, Ho Chi Minh, Emiliano Zapata, Simon Bolivar and Michael Collins. Whether one picks up the gun or sits-in at the presidential palace will depend on moral, intellectual and emotional judgments informed by religious training and convictions, social class and political ambition. Pl On the nonviolent/civil disobedience side we have Mohandas Gandhi, Martin Luther King, Aung San Suu Kyi, Desmond Tutu and Vaclav Havel; lining up with the armed struggle/revolutionary violence folks are George Washington, Ho Chi Minh, Emiliano Zapata, Simon Bolivar and Michael Collins. Whether one picks up the gun or sits-in at the presidential palace will depend on moral, intellectual and emotional judgments informed by religious training and convictions, social class and political ambition. Plus a survival instinct—whether you have a better chance of remaining alive with the rebels in the jungle or the protesters in the streets. Chenoweth and Stephan look at a broad range of civil conflict, both violent and nonviolent, and come up with a non-intuitive but very well argued reason for choosing the road that leads to the Oslo City Hall on December 10. Put very simply, nonviolence works better. They identify a number of reasons: lower barriers to active participation in nonviolent resistance by the population in general (easier to convince someone the carry a picket sign than throw a bomb), the disruptive effects of mass nonviolent noncooperation and the greater likelihood of shifting loyalties among regime loyalists and security forces. Additionally there are significantly fewer moral issues in civil resistance to a repressive regime than using weapons and killing to overthrow it. 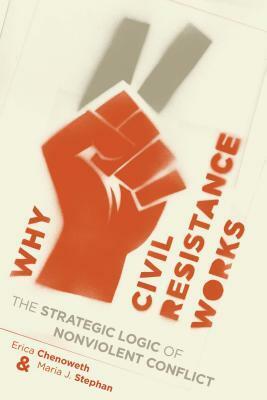 “Why Civil Resistance Works” seems to be a model of social science investigation of political phenomena. “Seems” because, since I am neither a scientist nor particularly social, I can’t judge their methodology. My only criticism is their sometimes artificial decision of when a campaign against an authoritarian government ends and therefore which of them succeeded and which failed. Myanmar/Burma is an example. The Saffron Revolution ended in repression and bloodshed in late 1997; monks and civilians were in the streets again in 2007; free elections which swept the inept, brutal generals from power happened this year. Chenoweth and Stephan call the 1997 events a failed nonviolent campaign and taken in isolation it was, as were the 2007 demonstrations. In order to gather data, measure it and draw conclusions investigators look at events as separate and isolated from their environment—if one is comparing two disparate things in this case violent and nonviolent resistance then it is necessary to strip away everything that isn’t comparable. Or at least one must attempt to. Another way of looking at the last 20 years in Myanmar, though, is as a continuum with opposition to the generals going underground, possibly gaining strength from the growing international condemnation of their dictatorial rule (although the authors do a good job of showing that outside assistance isn’t of much help) and strengthening their resolve. “Why Civil Resistance Works” has been praised by political scientists for its analytical rigor; I don’t have the quantitative or technical knowledge to know if they are right but will assume they are. However whether Chenoweth and Stephan prove their case isn’t as important as is their very lucid and polished style. Their deep immersion in the sources, critical reading and broad knowledge of the social, military and political causes and results of nonviolent resistance shows through. Review first published on My Blog. An in-depth study and analysis of how successful nonviolent and violent campaigns are historically. The thesis is that non-violent campaigns are more successful at achieving their results long-term and since they were looking mostly at regime changes, ending up in a more democratic government as well. They reviewed campaigns going back to 1900 and wrote about 4 specific case studies in the book to illustrate specific points (Iran, Philippines, Burma, and Israel/ Review first published on My Blog. An in-depth study and analysis of how successful nonviolent and violent campaigns are historically. The thesis is that non-violent campaigns are more successful at achieving their results long-term and since they were looking mostly at regime changes, ending up in a more democratic government as well. They reviewed campaigns going back to 1900 and wrote about 4 specific case studies in the book to illustrate specific points (Iran, Philippines, Burma, and Israel/Palestine). Their conclusion is that non-violent campaigns are more successful for a variety of reasons (which they do go into fairly deeply) than violent ones and have a better outcome over 5-10 years after. This was a little more academic than I expected it to be but still very accessible. Its message is very important, too - the data is in and violent insurgency is not a rational last-resort tactic that will succeed when all else fails. It's all statistical, of course, but the truth is that nonviolent civil resistance is more likely to succeed, more likely to result in peaceful democracy (as opposed to the insurgents taking over and being just as bad as the last lot), and safer to participate in. This was a little more academic than I expected it to be but still very accessible. Its message is very important, too - the data is in and violent insurgency is not a rational last-resort tactic that will succeed when all else fails. It's all statistical, of course, but the truth is that nonviolent civil resistance is more likely to succeed, more likely to result in peaceful democracy (as opposed to the insurgents taking over and being just as bad as the last lot), and safer to participate in. Oh, and violence is not generally chosen as a rational last-resort option, it's chosen because of anger and violent impulses, and because of the presumed futility of nonviolence, as much as anything else. Chenoweth and Stephan argue that nonviolent resistance movements are more likely to succeed than violent resistance movements. They analyze 323 violent and nonviolent resistance campaigns between 1900 and 2006, for regime change, territorial goals such as secession or evicting occupying forces, and other goals such as antiapartheid. They discuss how they sorted campaigns into violent and nonviolent categories, given that some groups may have violent and nonviolent phases or subgroups. They discu Chenoweth and Stephan argue that nonviolent resistance movements are more likely to succeed than violent resistance movements. They analyze 323 violent and nonviolent resistance campaigns between 1900 and 2006, for regime change, territorial goals such as secession or evicting occupying forces, and other goals such as antiapartheid. They discuss how they sorted campaigns into violent and nonviolent categories, given that some groups may have violent and nonviolent phases or subgroups. They discuss how they classify campaigns as successes, failures, or partial successes. "The most striking finding is that between 1900 and 2006, nonviolent resistance campaigns were nearly twice as likely to achieve full or partial success as their violent counterparts." They argue that nonviolent campaigns are more successful because they attract more, and more diverse, participants, because they have lower barriers to join the campaign. Violent campaigns require physical health, strength, agility, and weapons skills in their participants. Nonviolent campaigns attract more participation by communicating more information about their activities, intentions, and participants. Many potential participants have moral barriers to participation in violent campaigns. Violent campaigns require a much greater degree of commitment from any participant who participates at all. As well as greater numbers, nonviolent campaigns also benefit from greater diversity of participants, and participants' connections to the rest of the society, including military and police forces and the elite. "To summarize, rather than effectiveness resulting from a supposed threat of violence, nonviolent campaigns achieve success through sustained pressure derived from mass mobilization that withdraws the regime's economic, political, social, and even military support from domestic populations and third parties. Leverage is achieved when the adversary's most important supporting organizations and institutions are systematically pulled away through mass noncooperation." An absolutely amazing book that really breaks down civil resistance and the steps that go into it. This was one of the main books that I used for the writing of my senior thesis in college and I still find myself picking it up to refresh myself in this area. If you are at all interested in strategic nonviolence, you won't regret reading this book! A very excellent study about the efficacy of nonviolent civil resistance. My only beef with it is that the definitions of "nonviolent" and "violent" resistance campaigns is not given a lot of analysis. Early on in the book, the authors correctly state that "Few campaigns, historically, have been purely violent or nonviolent, and many resistance movements [...] have had violent and nonviolent periods. Armed and unarmed often operate simultaneously in the same struggle." Unfortunately, this complex A very excellent study about the efficacy of nonviolent civil resistance. This book's concept is pretty huge and its case studies work to prove it. It lacked, however, mention of the Czech resistance which successfully dealt with Heinrich Himmler, the chief architect of the Final Solution. It also did not mention Sophie Scholl's led student resistance in Munich, which history has proven a success - if only for its courage and timeless example of what is possible under a dictatorship. When I attempted to reach the author to ask why she did not include both of these mov This book's concept is pretty huge and its case studies work to prove it. Excellent and well laid-out research on the facts surrounding the efficacy of nonviolence in social movements ranging from national revolutions to small-scale worker's strikes. There were times though where I had disagreements with the exact reasons used to name a particular movement as a "success" or "failure". However, researchers looking for empirical evidence to back up theories on nonviolent vs. violent change will find much to use here. This book was named the winner of the 2013 Grawemeyer Award for Ideas Improving World Order. It is an excellent example of policy-relevant social science research using multiple methodologies. They utilize a large N-database to test the effectiveness of violent and nonviolent resistance (the latter succeed far more often) and they examine 4 case studies: Burma, Iran, Palestine, and the Philippines. The book is quite readable even for non-specialists. Wonderful book. It's gratifying that a professional social scientist has set her sights on this topic, to take it beyond mere opinion, speculation and/or faith. As a proponent of nonviolence, I'm gratified that she provides a lot of ammunition (pardon the pun) for arguing for the effectiveness of nonviolent methods. I look forward to hearing much more about this topic in the future. at a historic time of world wide civil resistance to overarching power, and provides a means of examining real life, current situations. Statistics does not give the cause of events. A really intelligent look at nonviolent resistance. This book picks up where Gene Sharp left off, builds upon it, and lets be honest is a heck of a lot easier to read! Erica Chenoweth, Ph.D. is Professor & Associate Dean for Research at the Josef Korbel School of International Studies at the University of Denver.